The world works in mysterious ways, and a most amazing connection was just made! the Hot Lunch Program. The smells wafting throughout the building send many a desk worker wandering off to sneak a peak or a taste of their savory treats. At the end of November, the catering team made an awesome Irish Stew and ended up with over a dozen meals left over. With no takers, Casandra (staff) loaded them up saying she’d find someone who needed to eat, but had no idea how! A few hours later she sat at a coffee shop in Newton, feeling discouraged after having the meals turned down by two different community service groups for those addicted and/or homeless. She was sipping tea when a man sat down across the table and started to chat. He had no cup. His name is Real (pronounced Ray-al), and he’s a French Canadian disabled veteran trying to find work and a home after a string of bad luck and painful losses. He was clearly cold & hungry, but didn’t once ask for anything in the half hour conversation. What synchronicity! 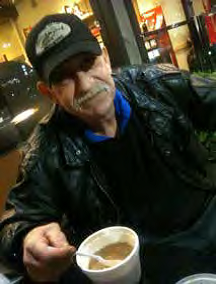 Moved by his kindness and his story, Casandra told him about Semiahmoo House and the catering program and asked if he knew of anyone in the area who might benefit from some hot meals. He said he may know someone, so Casandra ran outside & brought in the giant bag of healthy stew servings. Real, a proud man, stared at the soups and then shed a tear. “This is for real?” he said. “I mean, this kind of thing doesn’t happen.” Before limping away with his bag and his cane, he graciously posed for a picture and shook her hand with both of his. She drove off a few minutes later, and turning back, saw him and 3 others sitting beside the building out of the rain, each one with a container of stew in their cold hands. This entry was posted in Inclusion, Philanthropy, Staff Features, Uncategorized and tagged creativity, developmental disabilities, diversity, inclusion, philanthropy, self-actualization by The Semiahmoo Foundation. Bookmark the permalink.